One of the most storied myths is that of the pot of gold at the end of rainbows. Legend has it that Vikings once lived in Ireland. They raided Irish villages and later buried their ill-gotten treasures all over the countryside. Leprechauns wanted to teach these misbehaving humans a lesson, and hence reburied these pots in different locations, even deeper underground. Since leprechauns can become invisible, the only way to find their treasure was to follow rainbows. I’m sure you’ve tried chasing down rainbows so you’d know this: the rainbow just keeps moving when you do! Anyway, these elusive rainbow pots of gold strike wonderful parallels with the slot machines we play today. All of us are seduced by the irresistible hunt for large amounts of gold; all of us desperately wish that we’re the next lucky bloke to stumble upon fortune. Slot machines riff off these themes time and time again, so much so that Irish pots of gold and leprechauns are possibly the most clichéd imagery in all of slot history. Let’s go over the basic specs first. Silver Shamrock Slots is made up of 15 adjustable paylines, which means that you can choose how many paylines to play with each time. The more paylines you activate, the faster the game’s pace. How do you like to play? Do you spend all of your slot budget in a couple of intense slot spins or do you prefer to space them out over more spins, albeit less potent ones? Whichever strategy you choose, your odds of winning are not impacted. You could start playing Silver Shamrock Slots at a refreshingly low cost of 2p per spin. The total bet is a product of number of lines and bet per line. For example, if you choose to play with 10 lines at 10p a line, your spins will come in at £1 each. Should you feel like bumping up the game’s intensity, you could max out the bet per line at £1 each. You can also activate the auto-spin feature to enjoy the game in hands-free mode. The reels are covered in 12 different slot symbols. 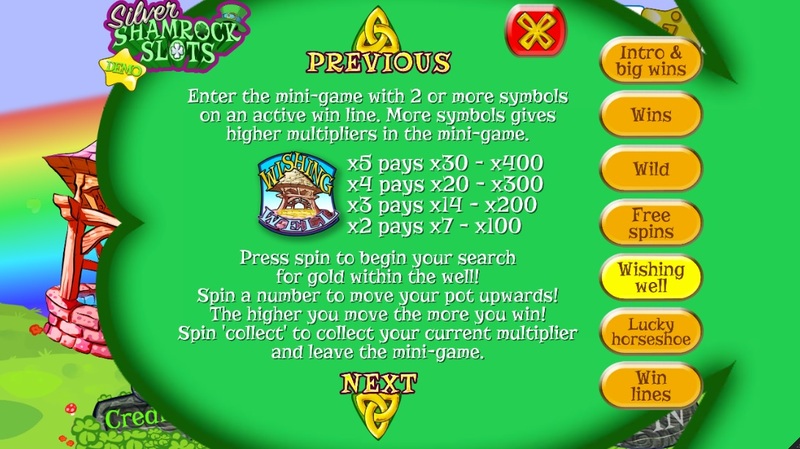 The low-value ones are the 9, 10, J, Q, K and A. It’s preferable to line up the leprechaun, horseshoe and the pot of gold instead, as these are the high-value symbols in Silver Shamrock Slots. There’s also a Wild symbol (styled as the four-leaved clover) that replaces all other symbols to complete winning paylines and a Extra Spin symbol (the cute little rainbow). The ultimate goal is to line up five golden pots to win the progressive jackpot. There’s only one thing you need to know about progressive jackpot: the prize pool keeps growing by the second. A portion of every wager in Silver Shamrock is set aside as the jackpot prize. The more spins are played on the game, the larger the jackpot. At the time of writing, the jackpot stands at just over £4,500. There’s room for the jackpot prize to grow ten-fold, as we’ve seen in other PocketWin jackpots. It just gets better and better by the day. The game is filled with all the typical Irish-themed imagery. Four-leaved clovers, horse shoes, leprechauns; the game designers have covered the lot. Yet, the tired theme is somewhat revived by PocketWin’s signature cartoon style. The colours are super bright, and there’s even a Nyan cat rainbow painted in the background! The game’s illustrations would not look out of place in a children’s book of fairytales. In a way, how the game evokes childish wonder is what is most charming about Silver Shamrock Slots. All of us would like to believe that we’re the next jackpot winner in line. That’s why we keep playing slots. As with all PocketWin games, the slot is designed by an in-house design team and therefore, cannot be played at any other casino site. The game is bundled into a neat little app, which you can download from their website. Simply enter your phone number at the PocketWin casino and you’ll receive a link to download the game. You can deposit in-game using your debit/credit card or even your phone bill. The money will be deducted from your prepaid credit balance or added to your monthly phone bill. You can deposit any amount from as little as £3. Imagine finding some forgotten pocket change in your coat pocket and wisely investing it in a bunch of Silver Shamrock Slots spins. It’s that easy! Game Features: Wishing Wells, Extra Spins! Let’s face it, the quest of unlocking a jackpot takes up a lot of time and cash. While waiting, feel free to lap up some extra mounds of cash in Silver Shamrock Slots’ unique mini games. There are two of these games to entertain, namely Wishing Well and Lucky Horseshoe. You’ll be hauling up buckets full of water in the Wishing Well feature. Instead of brute strength, the only effort on your part is to hit spin and let the wheel dictate how far up you can pull. The higher you pull up the gold, the bigger your multiplier will be. Of course, you’ll want to haul that pot all the way up to the surface of the earth. Achieve that and you’ll win the top prize – a whopping 50x multiplier onto your previous spin! The Lucky Horseshoe is a virtual version of the classic funfair game. You’ll spin the horseshoe on its peg and pick up the bonus it lands on! If you hit the clover, you’ll move on to an even bigger wheel and potentially land the horseshoe in the pot of gold. As you can expect, there’s an unbelievable bonus awaiting in that pot of gold. These two mini games are always welcome diversions from your regular gameplay. Besides the added entertainment, you will definitely pick up a healthy 20-60x multiplier too to pad your casino wallet. The best part of all is how frequently you’ll unlock these mini games. I had at least four chances at both mini games during my 20-minute gaming session. You might give this game a pass if you come upon it at any other casino. 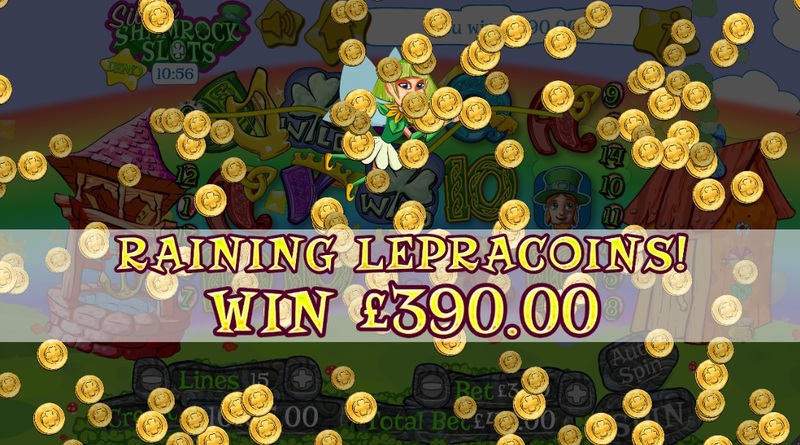 “It’s just another Irish-themed slot,” you might think. At PocketWin, there’s no reason to skip the game even if you’ve played a hundred different Irish slots before. After all, you’re getting free cash to play with! New players get a £5 cash bonus, totally free. You don’t have to deposit a single dime to enjoy this freebie. Unlike other casinos, PocketWin even lets you keep everything that you win. There are no sneaky terms and conditions or difficult wagering requirements that prevent you from withdrawing your winnings. If you’ve already played at PocketWin before, you’ll get 10% extra on top of every deposit. Want to play Silver Shamrock? Silver Shamrock The Silver Shamrock Slots is another crowd-pleaser from PocketWin casino. My colleagues were annoyed that PocketWin weren’t more imaginative when thinking up new games to produce. Being forced to review it, I gave it a try and was pleasantly surprised. It’s light, entertaining and most importantly, a money-maker. As PocketWin puts it, you could be DUBLIN your money in no time! NextNetEnt’s Arabian Nights Jackpot Hits Over £1.2 Million!